Kyle is torn between managing his business–and being left lonely in the Lone Star state–and risking everything to fly to Alaska to pursue Gretchen. The young oil man soon discovers that oil slicks are nothing compared to relational slicks. The early bird may get the worm, but the oily bird can ruin romance! I’ve always loved Ray Blackston, ever since I got Flabbergasted on a whim back in Manila International Book Fair 2006. I loved Jay Jarvis and the gang, and it’s a treat to read his books because I get to somehow peek into a guy’s mind and sort of understand them better. I think Ray is the only one I know who writes Christian lad lit. What’s lad lit, you say? To make it simple, it’s chick lit, but with a guy narrator. It has all the fun and setting and situations of a normal chick lit novel, but without the over thinking, ice cream and pink fluffy things that a normal chick lit novel has. In chick lit, we normally see girls gathering and having a shopping moment or having a time to eat ice cream or talk about a guy. In lad lit, there’s little of that: mostly girls, drives with guys, steak dinners, jobs and do less complicated guy stuff. Okay, I don’t know if that’s just a stereotype. I haven’t read any Nick Hornby (shame, I know), and I can’t really recall any books of the similar genre I read so I can’t have any point of comparison. But here’s the thing about Ray Blackston and his novels: they’re funny. No surprise there, since lad lit is supposed to be funny. 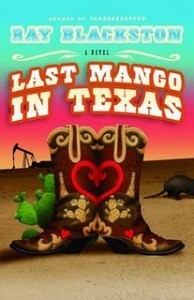 But it’s been a long time since I last read any of his books and Last Mango in Texas reminded me of the author’s wit and humor. We meet Kyle Mango, the protagonist, as he gets to sit with his dad to have “the talk”. His dad had his own version of the talk to him, telling Kyle that he would just have to figure things out on his own. This left Kyle totally in the dark with how to relate with girls, and he wasn’t surprised when his dad left them for another woman. But here came Uncle Benny, Kyle’s doting uncle, who helped their family with his stash of silver buried under the Texas land that he owns. Fast forward a few years later, Kyle gets to college and we find him as a pledge to a fraternity, which he soon realizes that he didn’t want to be a part of. Kyle meets Gretchen, an artsy environmentalist whose hair smells like honeysuckle, and he was immediately smitten. Gretchen helped him escape, but later Gretchen breaks it off with him, saying she has to focus with her studies. We meet Kyle again as a senior, where he still pines for Gretchen, and his Uncle Benny still provides for their family. Stolen silver, a death, four inherited oil wells, graduation and a trip to Alaska later, Kyle wonders if he is meant to pursue Gretchen and still be an oil man, or if he would have to give up one to have the other. And speaking of prayer, there isn’t much praying mentioned here, but Gretchen and Kyle mentions God a lot, and there’s a mission to Africa that they all eventually went to. This makes it less preachy, and I guess more male. Christian chick lit is always filled with the women praying, and God talks are always there, so you never stop feeling that it’s a Christian novel. I guess that’s because women are naturally more talkative about their feelings, including their faith, while men don’t do that so much. It’s not a bad thing, although I’d wish that there was more church mentioned in this novel, but Kyle never grew up in that environment so that’s asking a lot. The story flowed nicely and it didn’t jump so much that I got lost in the time line. What I kind of find it hard to believe is how Kyle can be such a businessman at the age of 22. Perhaps it’s really the way there in the US, and if you inherit four oil wells. What was I doing at the age of 22? Working and spending my own money, and looking for the highest paying affiliate programs to earn more money. Hrm. Maybe things just really get to them easier than it does for us. But what I love about this novel is it’s very, very clean. There were kisses, but none of the passionate kind, and yet there’s still the romantic moments that will surely make the reader smile. It’s nice to read something and not be worried if there would be questionable scenes in the novel.